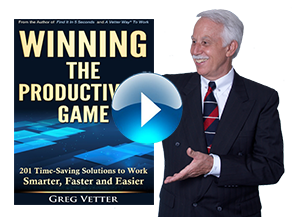 Lead Productive Meetings | Vetter Productivity, Inc.
“A Vetter Way®” is a totally interactive, hands-on and experiential, introductory program on how to run meetings. Participants are involved in individual and group exercises allowing them to learn how to facilitate successful meetings and get optimal results from them. • Attend too many meetings. • Go to meetings that never should have been called. • Don’t know how to deal with difficult meeting personality types. • As a boss, be expected to attend everyone’s meeting. • Attend poorly facilitated meetings. 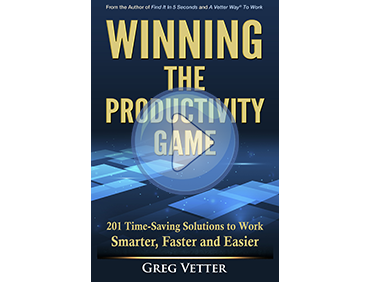 • Shorten and eliminate unnecessary meetings. • Know when and when not to call a meeting. • Handle difficult meeting personality types. • Create and utilize forms that will streamline your meetings. • As a boss, learn how to shorten the time you spend in meetings.